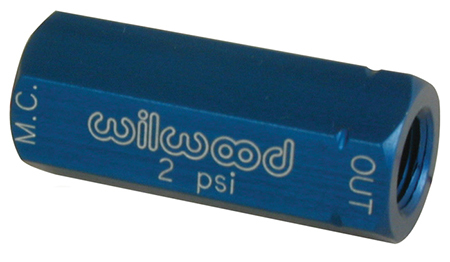 Wilwood two pound residual pressure valves retain a minimum brake line pressure to help eliminate excessive pedal travel in both disc and drum brake systems. The two pound valve is used in disc brake applications where the master cylinder is mounted below the horizontal plane of the calipers and fluid drain back occurs from gravity and vibration, thereby causing excessive caliper piston retraction and a longer brake pedal stroke. The minimal two pound residual pressure prevents fluid from flowing back without causing the brakes to drag. Residual Pressure Valves are made from billet aluminum and color coded for easy identification.